I feel like we started off summer real strong. Activities aplenty, supplementary workbook pages completed (and enjoyed!!) left and right and we even managed to cross off two of the three book reports on my oldest son's summer reading list long before their September deadline. 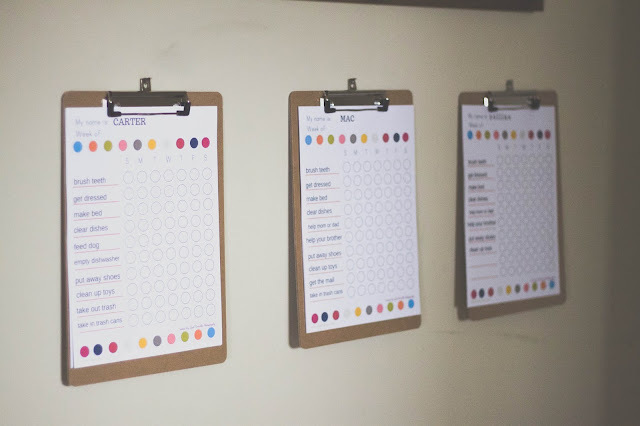 In order to kick this lazy spell to the curb, I decided a refresh was in order for the boys' chore charts which are conveniently located in our mudroom. 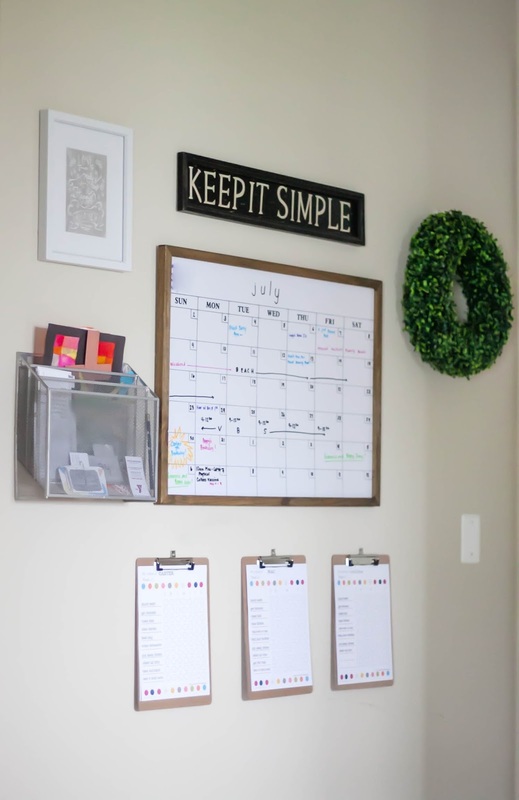 A face lift in the form of a snazzy free printable off Pinterest and a few new packs of stickers later, their enthusiasm to do their household duties was reignited. That's not to say there won't be some teeth gnashing and whining in the coming weeks when reminded to complete their chores but for now I'm going to bask in this new found excitement for as long as humanly possible. 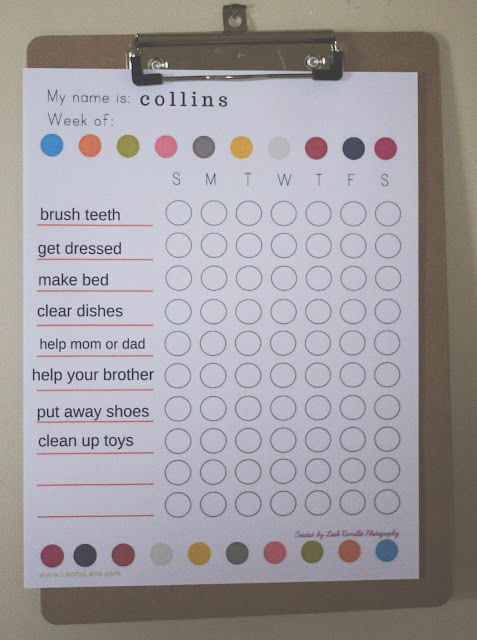 I recently shared a glimpse of their chore charts over on my Instastories and received quite a few questions about age-appropriate chores, our personal expectations and the reward system we currently have going in our home. The easiest way for me to tackle these questions, of course, is a blog post! I'll be sure to link all resources below! We initiated "chores" when my oldest turned 4. 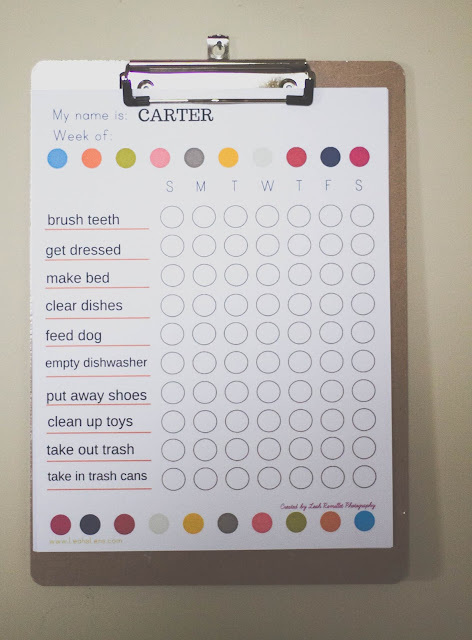 Now, by "chores" I really mean fun things that he already enjoyed doing around the house that when drawn onto a sheet of paper and taped to the wall boosted his excitement ten-fold to complete them, earning himself a sticker which he then got to plop on his chart. These "chores" included brushing his teeth, watering the garden, feeding the dog and cleaning up his toys. 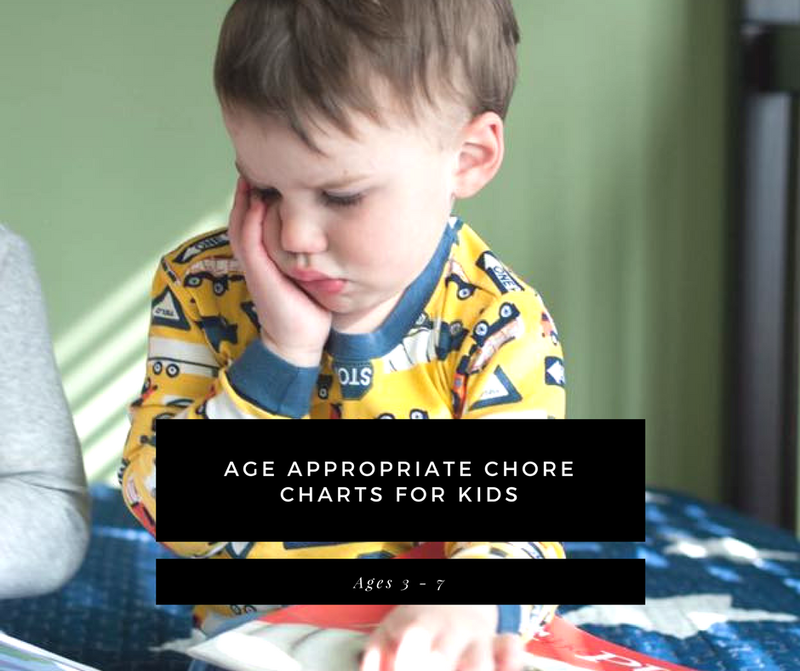 As the boys age, so do our expectations of them which you can clearly note in the various chores listed on each of their charts. For reference Carter is almost 7, Mac is 5 and Collins is 3. Obviously Collins and Mac require a little extra direction when it comes to marking up their charts due to their inability to read ;) While I easily could've printed off picture versions of their chores, I prefer to keep everything as uniform as possible. As for our reward system, for the most part, we don't really reward the boys with anything other than heaps of praise. Both my husband and I are of the mindset that being part of a family means you chip in and help do your part to keep the household running successfully. In today's society of entitlement and immediate gratification, we try every day to ensure we're teaching our boys the value of hard work. That said, when we do witness the boys going above and beyond their typical chores they are absolutely rewarded with a little extra money for their piggy banks. While the two little boys are satisfied with handfuls of loose change, we've started to tackle the power of money and the importance of saving with our oldest and in order to differentiate his abilities from the little boys, he is often given a dollar or two at the end of the week should he put in a little extra elbow work around the house or act exponentially kind towards his brothers. As for the satisfaction of an immediate "job well done!" 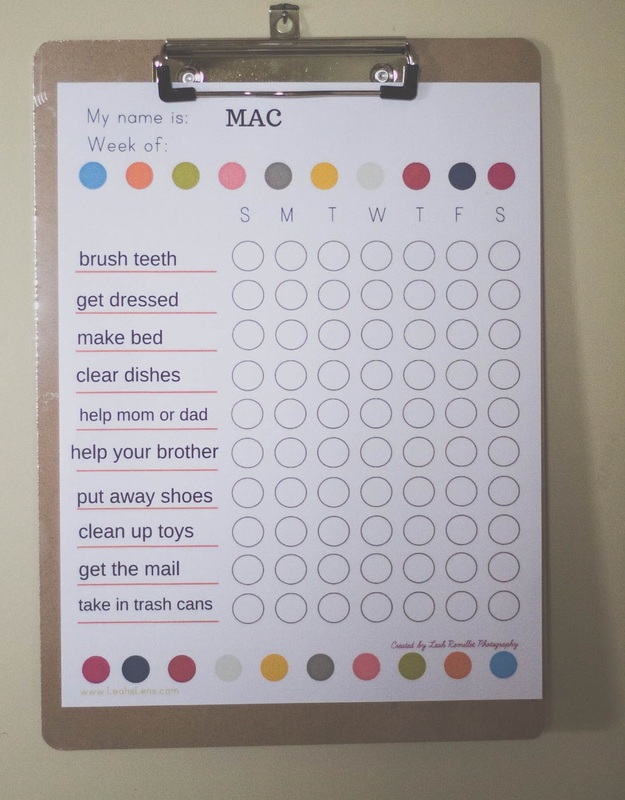 the boys may choose a sticker from the sticker basket and use it to mark up their completed tasks. If the boys willingly completed most of their chores without too much nagging from either my husband or myself, often times we'll take them out for ice cream or a similar treat at the end of a long week. I would love to hear how you tackle chores and responsibilities in your home! I'm always learning from my fellow parents and truly appreciate all the tips and tricks we can share. Please leave them in the comment section below or over on my Facebook page! Thank you so much for sharing my chore chart. This site where it's currently hosted will be going down soon, but I've moved the chore chart to our travel/family blog. Would you mind updating your link to: http://abroadernest.com/blog/free-printable-chore-chart/ THANKS! !